Brendan Rodgers threw Daniel Sturridge straight back into the first team as he switched formations, but Liverpool were held again as Liverpool's deficiencies were again exposed. Benteke and Daniel Sturridge started together for the first time and Liverpool did look slightly improved on recent weeks - although Norwich will not be a side troubling the top echelons of the division. But after 5 months away from the first team, Sturridge was seemingly not the Danny that Liverpool needed. Danny Ings replaced Benteke at half time and scored his first Liverpool goal three minutes later - but another clanger by Mignolet from a rare Norwich corner gave the canaries a point. Liverpool misfired at the other end and the reds dismal Premier League performance now stretches to almost half a full season. Liverpool's mere 4 wins from the last 15 league games (16 points out of 45) can no longer be regarded as a blip. Rodgers risked further damage to his reputation following the game - insisting that in his 4th season Liverpool were at the start of an exciting new project. The final whistle was met with disappointment around the ground, with a rare vocalisation of displeasure. Mamadou Sakho was returned to Liverpool's Premier League team, with Dejan Lovren pushed back onto the bench. Emre Can and Martin Skrtel completed the three man backline. Alberto Moreno took his opportunity of a Premier League start and was one of the more promising of Liverpool's players, but captain James Milner endured a mostly disappointing day. Booked in the 2nd minute, with a continual stream of misplaced passes - it came as a surprise when it was Lucas who was taken off instead of the former Man City man. 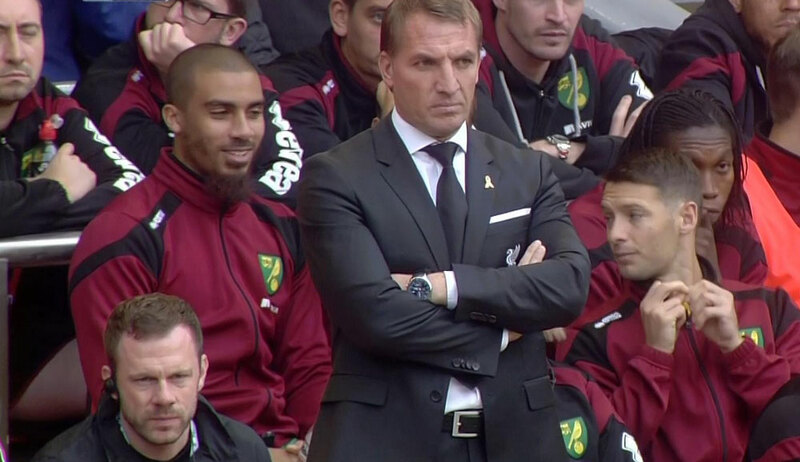 On the hour the moment of Norwich's equaliser. A corner for the opposition always spells trouble under the Rodgers regime and it wasn't helped with a weak punch from Mignolet that was dispatched by Norwich captain Russell Martin, a man who had flown up late for the game after the arrival of his baby son a little over 6 hours earlier. At the other end John Ruddy was cleanly catching every cross that landed his way. Before the restart following Norwich's equaliser Brendan brought off Daniel Sturridge - replacing him with Adam Lallana who offered little threat in the final half an hour. Next up the potential banana skin of a cup tie against League Two side Carlisle United. The natural order of the competition is to play a youthful looking side. In Liverpool's current situation - this may not be a strategy the manager can risk taking. Liverpool fall to 13th - the next Premier League game is again at Anfield with Aston Villa the visitors.